The company proudly pioneered once again by launching these latest devices in the Philippines. With over three weeks to go until the official release of the Samsung smartphones in the country, Globe Telecom customers will be the first to own the much-anticipated next-generation smartphones — Samsung Galaxy models. get free exclusive content such as a 3-month subscription to Spotify where they can create their own playlist with millions of songs and 3-month access to HOOQ where they can watch from a selection of over 10,000 movies and TV series from local and international partners. Customers entitled to receive a free limited edition Samsung wireless charger and a discount voucher which will give them up to 15% discount on Galaxy S6 and S6 edge accessories. Samsung Galaxy S6 and Samsung Galaxy S6 Edge with the new myLifestyle Plan offers. ree Gadget Care and Navigation Bundle for 1 month and free 1GB of Globe Cloud. free Gadget Care and Navigation Bundle for 1 month, and free 1GB of Globe Cloud. Globe Platinum customers can also avail of the Samsung Galaxy S6 edge with all pre-order freebies on its newly-introduced Platinum Lifestyle Plan 4999, which offers unlimited calls and texts to all networks, 15GB worth of local mobile data, access to Facebook, Viber, Gmail, Yahoo Mail, Evernote and Globe Cloud on top of the 15GB data allocation, worldwide roaming services and a roster of exclusive Platinum perks and privileges. Plus, pre-orders will be delivered directly to the customer’s doorstep. equipped with rich, bright and fast 5-megapixel front and 16-megapixel rear camera. Sports an incredibly fast wired charging which is 1.5 times faster than the Galaxy S5, providing about 4 hours of usage after only 10 minutes of charging plus a 1.5GHz octa-core processor and multi-window feature which allow users to multi-task seamlessly. 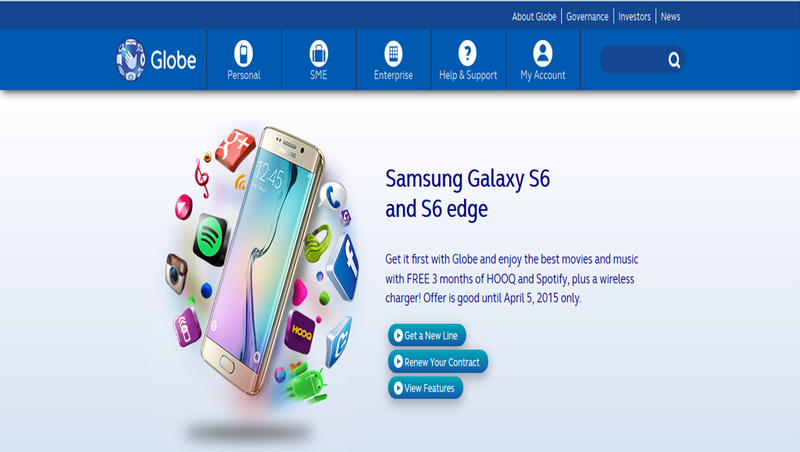 Regular Postpaid customers who pre-ordered online can start claiming their Samsung Galaxy S6 or S6 edge starting April 18, 2015, at designated Globe stores nationwide. To pre-order, the Samsung Galaxy S6 and Galaxy S6 Edge online, visit www.globe.com.ph/galaxys6.